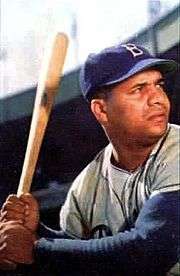 Roy Campanella, the namesake of the award, in about 1953. The San Francisco Giants have given the Willie Mac Award since 1980 to "the player on the San Francisco Giants who best exemplifies the spirit and leadership consistently shown by Willie McCovey throughout his long career." The Oakland Athletics have given the Catfish Hunter Award since 2004 to the "player whose play on the field and conduct in the clubhouse best exemplifies the courageous, competitive and inspirational spirit demonstrated by the late pitcher, Jim "Catfish" Hunter." ↑ Baseball-almanac.com. "Roy Campanella Award". Baseball-almanac.com. Retrieved 2011-10-01. ↑ MLB.com (2006-09-23). "Furcal wins first Campanella Award". Major League Baseball. Retrieved 2011-10-01. ↑ MLB.com (2007-09-26). "Martin wins second annual Roy Campanella Award". Major League Baseball. Retrieved 2011-10-01. ↑ MLB.com (2008-09-24). "Loney wins third annual Roy Campanella Award". Major League Baseball. Retrieved 2011-10-01. ↑ MLB.com (2010-09-23). "Carroll wins fifth annual Roy Campanella Award". Major League Baseball. Retrieved 2011-10-01. ↑ MLB.com (2011-09-20). "Kemp wins sixth annual Roy Campanella Award". Major League Baseball. Retrieved 2011-10-01. ↑ MLB.com (2012-09-26). "A.J. Ellis wins seventh annual Roy Campanella Award". Major League Baseball. Retrieved 2012-10-26. ↑ MLB.com (2013-09-26). "Kershaw named Roy Campanella Award recipient". Major League Baseball. Retrieved 2013-09-26. ↑ Stephen, Eric (September 22, 2014). "Clayton Kershaw wins Roy Campanella Award for 2nd straight year". truebluela.com. Retrieved September 22, 2014. ↑ "Zack Greinke Wins 10th Annual Roy Campanella Award". Dodgers Beat. September 30, 2015. Retrieved September 30, 2014.